Many cat guardians long to give their cats the excitement that being outside brings. Sight, movements, sounds and smells are enticing to cats. On the other hand, cat guardians know that letting their cats outside without supervision is NOT a good idea. Solutions for some guardians include fencing their yard or using a large cat playpen. 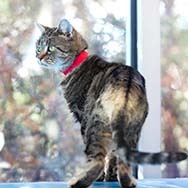 If your cat enjoys the outdoors and you want to find a compromise, try training your cat to accept a harness and a lead. 1. First, get your cat used to wearing a harness indoors. A harness is safer than a collar because it is more difficult for a cat to get out of one. You can give her smelly cat treats while she is wearing it or put it on right before her mealtime to help her get used to the new sensation. You can also have a playtime with her favorite toy while she wears it for the first time to distract her if she seems at all bothered. 2. Once she is used to wearing the harness, attach a cord to the harness, and let her drag it around so that she gets used to the feel of tension on the harness. 3. If your cat is comfortable with it so far, pick up the lead in the house and see if you can get her to follow you. You may use cat treats or something that she really likes to help coax her to follow along. 4. Once she is comfortable with all of the above steps, you can now go outside. Make sure the first few times you lead your cat outside that it is a quiet time of day and start in the backyard or a place where there will less activity. We do not want your cat to have a negative reaction or be frightened by this new experience. 6. Never leave your cat outside unattended for his or her safety. Remember that grass and woods are much more interesting to your cat than a concrete sidewalk! Using a leash with a harness makes it safer to take your cat outside to give mental stimulation and possibly physical exercise as well.